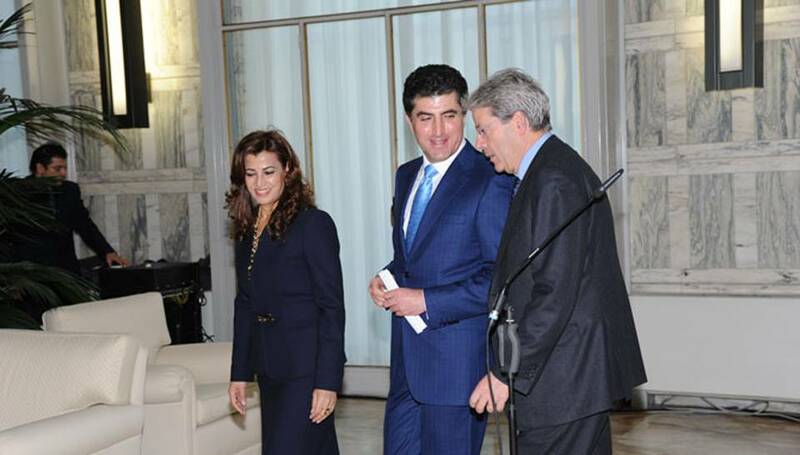 Today, Mrs. Rezan Kader accompanied Prime Minister HE Nechirvan Barzani and his delegation at the Italian Foreign Ministry to meet with the Minister of Foreign Affairs and International Cooperation Paolo Gentiloni. The delegation was composed of the Deputy Prime Minister, Dr. Qubad Talabani, the Minister of Religious Affairs, Min. Kamal Muslim, by the Head of the Department of Foreign Relations, Minister Falah Mustafa, the Spokesman of the Prime Minister, Dr. Safeen Dizayee. The two sides discussed bilateral relations between the Kurdistan Region and Italy, the latest developments in the war against the terrorist organization of the Islamic state, ISIS, and recent victories by peshmerga forces. The liberation of the city of Mosul and the importance of including the various ethnic and religious Iraqi groups in the operation in coordination with the forces of the international coalition, were highlighted in the talks. During the meeting, they discussed also about the situation of displaced Iraqis and Syrian refugees who fled the violence of ISIS and took refuge in the Kurdistan region, the agreement reached between Erbil and Baghdad last December and the crisis in Syria and its repercussions on neighboring countries. Foreign Minister Gentiloni reiterated the commitment of his country to provide humanitarian and military assistance to the Kurdistan Region, confirming what the Italian Prime Minister announced the day before. With regard to the upgrade of the Italian diplomatic mission to Consulate General in Erbil, he added that this decision was proof of the importance that Rome puts in her relationship with Erbil. Prime Minister Barzani expressed his gratitude to the Italian government for supporting the Kurdistan Region in its fight against terrorism and for its decision toturn its diplomatic representation in Erbil into a Consulate General. As regards the relationship with Baghdad, the Prime Minister said that the Kurdistan Regional Government remains fully committed to the agreement signed with the Iraqi federal government, adding that the Kurdistan Regional Government has always been ready to solve all problems with Baghdad through dialogue and mutual understanding. 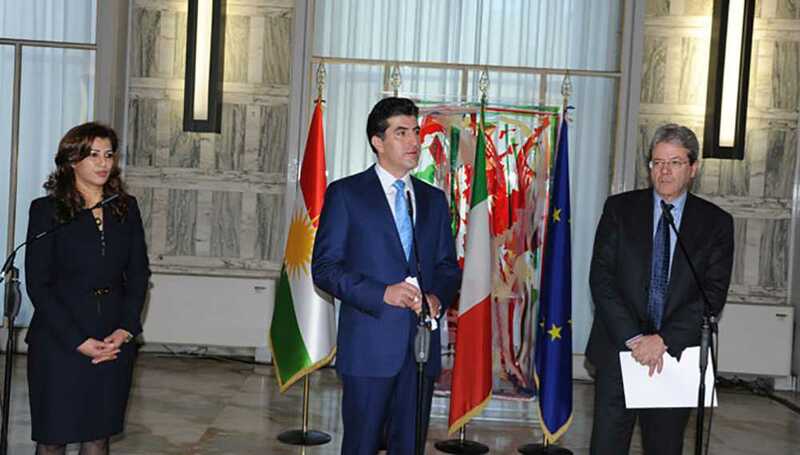 Following the meeting, Prime Minister Barzani and Minister Gentiloni held a press conference in front of the main news agencies and Italian and foreign televisions.